Differently from GPON, WDM-PON needs one optical interface per user not only in the ONU but additionally in the OLT. Because of this, optical interface technologies are a key in implementing a cost-effective WDM-PON. A trivial method of realizing a CWDM-PON is to use standard CWDM Transceiver. In this way, however, the price of optical interfaces scales linearly with the number of users, being too high if a large number of users is considered. Moreover, colored ONU have to be used, thereby increasing operational costs because of the more complex control over spare parts. Both problems might be solved by a new class of components, called Photonic Integrated Circuits (PICs). The functional scheme of the transceiver containing a transmitting along with a receiving PIC is represented within the figure. In the transmitting PIC, a bar integrating a certain number of lasers is coupled with a PLC MUX/DeMUX (generally an AWG) that launches the multiplexed channels into the output fiber. The scheme of the receiving PIC is identical, with a DeMUX, a bar of photodiodes, along with the WDM signal incoming in the input fiber. 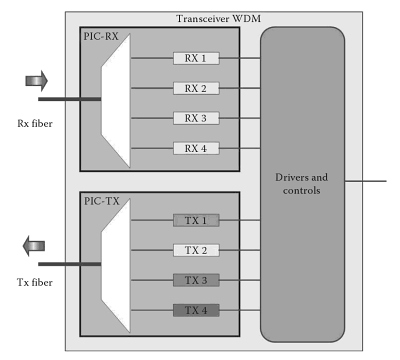 Similarly to CWDM SFP, it seems easy to implement CWDM PIC without thermal stabilization. Besides reducing the cost of OLT colored sources, PIC technology may be used also to design colorless ONUs. In this case, a PIC may be used like a tunable source, switching on only the lasers tuned on the desired wavelength. Since PIC technology is still under development, especially CWDM PIC that the market expects to be uncooled, it is difficult to foresee just what the cost of one PIC for any certain production volume will be. 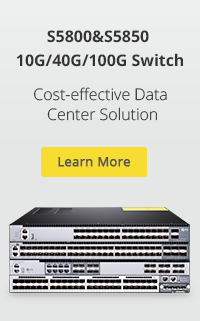 In any case, considering a 16 wavelength CWDM-PON, in order to have an industrial cost equal to that of a GPON, a 16 elements PIC should cost around the unique burst mode interface of the GPON, and this is really very hard cost wise. The PIC is also the method of try to reduce interface costs in XWDM-PON. It’s to underline the first PIC prototypes were realized at 10 Gbps because of application within the digital optical network or just to reduce the price of metro equipment. Also, when it comes to WDM-PON, the adoption of PICs have to be taken into account when handling the network. The problem, as in the case of the DON, is OLT PIC failure. In this case, a set of ONUs, otherwise a complete WDM-PON, loses the signal. Individual protection of PICs in to the OLT is thus practically mandatory, and this also impacts around the final OLT cost. As far as the XG-PON is concerned, the discussion is much more complex. In the point of view of optical interfaces, on the floor of standard requirements, there aren’t so many choices from one of the state of the art. 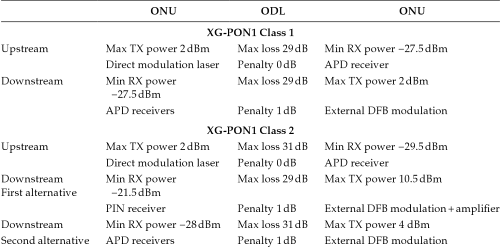 The options of the transmitter and receiver are summarized in the table for class 1 XG-PON1 (28 dB power budget) and sophistication 2 XG-PON1 (31 dB power span). These optoelectronics components can be nounted onto a package using micro-optics methods and they can also be assembled inside a hybrid or monolithic chip. In almost any of these cases, all the considerations already done for the GPON still hold using the further issue the circuit to share the electrical signal to the modulator at 10 Gbps is much more complex with respect to that working at 2.5 Gbps, thereby further increasing the cost of the OLT optical module package. Besides these components that are just about all in common with the GPON case, when it comes to the XG-PON1, another difficulty arises, that is not present in the GPON. Due to the broadcast nature of the ODN and the continuous change of frame slot allocation among the ONUs due to the DBA, the signal arriving at the ONU is really a burst signal and it needs a burst mode receiver. Every ONU receiver should be able to detect the appearance of a burst and also to rapidly lock the sampler in the burst, so as to sample the signal at the right point of the bit interval. While at 2.5 Gbps, a burst mode receiver is tough to implement, at 10 Gbps it’s a real technology challenge. The first experimental components were presented in the year 2009, but more development will be needed to attain the desired performance and cost targets imposed through the applications. 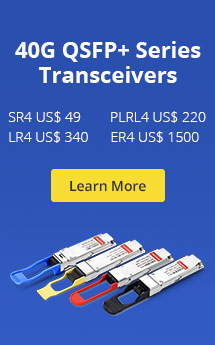 As a largest provider of fiber network solutions, Fiberstore has been supplying Passive CWDM/DWDM devices for WDM-PON applications for years. There are CWDM MUX/DeMUX/OADM/Transceivers, DWDM MUX/DeMUX/OADM/Transceivers, DWDM EDFAs, Transponders, etc.. This entry was posted in FTTH Network, WDM & Optical Access and tagged CWDM-PON, Passive CWDM/DWDM, WDM-PON, XWDM-PON. Bookmark the permalink.